MARISHOME - Just 352 yards (10 minute walk) from a beach access in Southern Shores! Soundside in the dunes of Southern Shores, Marishome features 5 spacious bedrooms and 3 full baths. The master bedroom has a full bath with shower and deep jetted tub - both with windows overlooking private pool below. 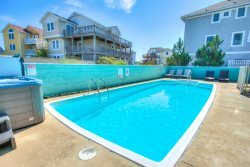 The home is decorated with a tropical flair mixed with Outer Banks vacation comforts! The interior features 3 levels. LEVEL 3 is a game room with foosball table, high chair storage, futon, telephone, flat screen TV, DVD and CD stereo. LEVEL 2 features the main living area with open great room with high ceilings and elevated flat screen over fireplace (fireplace is not available during rental season), bay window, lots of oversized windows for natural light. There are many track lights, ceiling fans, hardwood floors (refinished 2016), large breakfast bar with seating for 4, fully equipped kitchen (new Refrigerator, Range, Range Hood Fan 2016), and dining seating for 10. This level also features main master bedroom with master bath and walk-in closet, queen bedroom, bedroom with 2 twin beds, 1 full bath with tub in hall. There is a separate office which includes: desk with chair, high speed internet connection, flat screen TV, DVD player, CD Stereo, comfy chair, 6 windows overlooking the pool, doctor office style sliding glass window so you can stay connected to happenings onside and work with quiet. Over 200 book Library for guests - many hardbacks. Rear screen porch with 2 ceiling fans faces southwest and overlooks the pool and includes table and chairs, front covered porch with seating. All Bedrooms have elevated flat screen TVs & Ceiling Fans (except Level 1 Bunk Room). LEVEL 1 (Ground Level) includes a 2 car garage with fold-away ping pong table. Check out the half-solid door at top of Stairs - to keep small ones from steps down to game room. Full size game room with bank of windows overlooking pool area - check out the effect of the rippling water from pool lights reflecting into home on levels 1 and 2 in the evenings! Game room also features 2 futons, mini kitchen with cabinets, sink, microwave, and full size refrigerator with ice maker. There is also a counter and bank of cabinets and drawers on north end of game room which houses a video library and entertainment center which includes a large flat screen TV, DVD player, and CD player/stereo. There is 1 full bath with tub off of the game room, 1 queen bedroom with full size crib, 1 bedroom with 1 bunk and 1 pyramid bunk, and door from game room to pool deck with safety gate. Outdoor Amenities feature a large 18’ x 40’ pool with a depth of 3 1/2 Feet to 5 1/2 feet with 2 Person Seating/Swim Platform. Six foot high privacy fence with lighting makes this pool very private from neighbors. Approximately 10 feet plus concrete deck around pool for plenty of room for Entertainment & family fun! There is a large enclosed private outside shower with dressing area, foot shower by pool, tons of exterior lighting and basketball goal. Great neighborhood for walking and bike riding, and is convenient to Duck/Corolla as well as Kitty Hawk south. Walk to dedicated beach access at traffic light at East Dogwood Trail. It's just a 15 minute walk to the beach, or a 5 minute drive. There are over 100 parking spaces at the Southern Shores private community beach access at Hillcrest Drive (which is available to guests staying at MARISHOME), with a dune-top deck, gazebo deck, volleyball court, open outdoor shower at entry, port-a-johns, and seasonal lifeguard stand. Private beach access passes are provided at check-in. Access information to Southern Shores' community tennis courts is also provided at check in. Additional community amenities include: Boat ramp, 2 play parks, North Dogwood Trail sandy Sound front beach with picnic tables and play park - great for capturing some beautiful Carolina sunsets! Top-Level: Game Room with Foosball Table, Futon, Flat Screen TV, DVD and CD stereo.